There was a time when Technos ruled the beat-'em-up genre of fighting games during the 8-bit era with their Double Dragon and River City Ransom titles, but sadly the 16-bit generation wasn't as kind to the company. 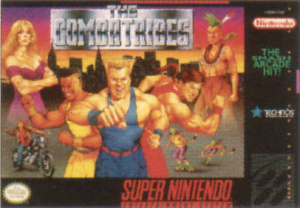 Once Capcom's Final Fight hit the scene, there was little room left for any other beat-'em-up, not even a port of their popular The Combatribes arcade game for the Super Nintendo. 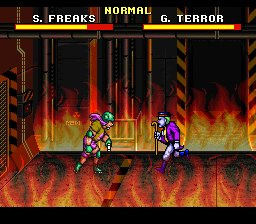 In fact, Capcom's brawler releases on the Super Nintendo system quickly became the new standard by which all beat 'em up titles were judged and The Combatribes just didn't measure up. The Combatribes plays pretty much like any other beat-'em-up you've played over the years with little to no originality in terms of what its gameplay system has to offer. You've still got a host of kicks and punches at your disposal that require little more than button mashing. There will even be times when you can pick up an enemy from the ground and whirl them around for laughs, but it's something that seems to happen more by luck than by any type of planned gameplay skill. Unlike many other genre efforts, you don't really get to scroll along an area — you're only given a small area off to the right you can walk to and then you have to turn around and return to where you started the level to take on the boss fight. If it sounds pointless, that's because for the most part it is. Another annoyance is the fact that your character no longer has access to any types of weapons that were available in the arcade version. While this might not sound like much of a hindrance, you'll quickly find out otherwise when you see that all of the bosses still have their weapons, making for some very cheap AI and overly difficult boss fights. 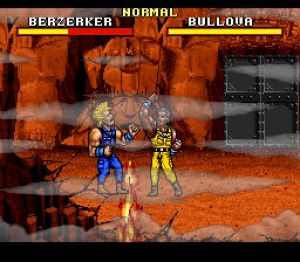 If you don't want to take on the game's one- or two-player story mode, you can even play the game in a one-on-one match that resembles a more traditional fighting game, minus the large variety of executable moves. It's a nice addition, but doesn't add a lot to the overall package considering it's still basically more of the same, just with fewer enemies to take out. The control scheme of The Combatribes is simple, but it's often so unresponsive that it makes playing the game more of a lesson in futility than any type of enjoyment. Tack on some unfair boss difficulty and very little in the way of strategy and you have a gameplay system that tends to feel more tedious than anything else. Beat-'em-ups have long been known for their dumbed-down fighting mechanics, but The Combatribes reaches new lows in terms of variety and play control system. Visually The Combatribes is a mixed bag. While the characters themselves have a nice look to them and animate quite well, the backdrops in most of the game's areas tend to look quite drab. It doesn't help that the playing areas themselves are so small in size that you won't get a chance to see much in the way of variety as you play through each stage of the game. The presentation is decent, but certainly not on par with some of the more detailed 16-bit offerings from Capcom. If there's one area of The Combatribes that has some charm and personality, it's the score. The musical tracks in the game are all quite catchy and they all feature a very distinct sound. It's clear from playing that far more emphasis was placed on the audio package than any other facet of the game. Even the sound effects are very well done. About the only downside to such a solid audio presentation is that you'll wonder why the developers didn't put more effort into the other areas of the game. Unless you're a huge fan of the beat 'em up genre, you'd probably be better off passing on this mediocre offering. 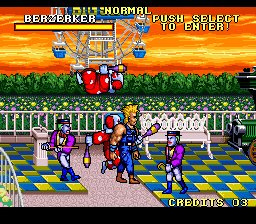 Given that Capcom's much better Final Fight titles are already available on the Virtual Console, you'd be better off going with one of those than this below-average arcade port. The Combatribes might have enjoyed some success in arcades at one time, but it's really showing its age and its glaring flaws can simply no longer be overlooked. Just what I expected. It looked absolutely boring in every single vid I'd seen of it so far. The title of the game is about the only good thing about this... totally outclassed by the likes of Final Fight and Streets of Rage sadly. Great review Corbie! They should give us Super Double Dragon. That is a great game! Good review Corbie. I almost downloaded this and now I am really glad I didn't. I never played this game before. I thought that it would be good for some beat 'em up fun but it seems that it has aged badly. Thanks for saving me 800 points. "A beat 'em up that packs very little punch"
Wow, NintendoLife and IGN give the exact same mediocre score to a Virtual Console game...it must be mediocre! I'll get Golden Axe 2, instead. I actually love this game. 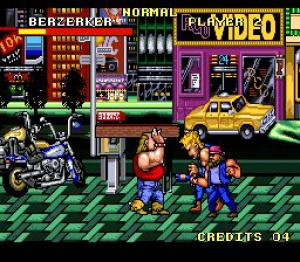 It's good fun, and in no other beat em up can you smash a clowns face into the ground. Although the bosses can be cheap, they become a lot easier in co-op. Ah well, to each his own. I'll probably wait until (and if) they release the arcade one, since it's quite a bit better. I played the arcade version and found it to be very fun. Granted its not as good as Final Fight or Streets of Rage, but still fun. They really dumbed this SNES version down from the arcade release. At least the arcade version was fairly playable. This one feels a bit broken at times and very unbalanced. Ah well, at least there are some decent tunes in this one, I was not expecting much from it, I do not remember it getting much praise even on its original SNES release. The smaller areas sound a bit like Technos were taking this back to the roots of their 1986 arcade game Renegade. Cheers for the review Corbie, I will be giving The Combatribes a miss. 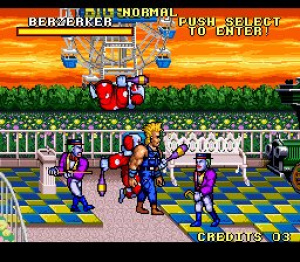 I never thought much of the arcade game given you already had Final Fight, Double Dragon, Bad Dudes, Ninja Gaiden and any number of other games to choose from. No surprise the SNES port was lacking in comparison as well! I think its just easier for them to give us console games rather than arcade games. there isn't one machine that is able to run all arcade games, each individual company would have to make their own emulator for the Wii in order to run their own games. as far as my understanding goes. And this is the second VC SNES game to score under 6/10, hope we don't see too much more. Thank god for SOR2. This game don't look too great anyways. Huh. I guess that review I read awhile ago from RVGFanatic was based off nostalgia. I guess I won't be trying this game for a while now after all (but I'm still interested). Good review, Corbie. By the way, is it just me, or does that blond guy look like Guile from Street Fighter II? Judging from the supposed unresponsive controls, I'd say it's less than mediocre. I'm going to assume the arcade version is on one of the numerous collections out there? If so, I'd probably be better off with one of those, should I ever bother with them. Huh. I remember that I used to love this game as a kid. Not sure how I'd feel now. You fight a gang called GROUND ZERO in NYC. The prophetic nature of this games merits at least one more point. I was going to buy this, but with a 4 out of 10 and poor controls I will wait til I have some money to blow on something not worth the money. Thanks for the review. the game is still pretty fun and technos definitely had good 16 bit beat em ups including Shin Nekketsu Kōha. final fight for snes was the worst version of it anyway and the sequels weren't that great. Its a fun game but I do agree that bosses can be very cheap. @Mickeymac Man, a collection of all of these old Technōs arcade and console games would be brilliant. Just imagine Karate Champ, Renegade, the Double Dragon series, River City Ransom games, arcade Combatribes, plus throw in some Super Dodge Ball titles and grab the WWF Licences for WWF Superstars and WWF Wrestlefest and retro gamers would be laughing (yeah right, I'm spouting rubbish there, like they would be able to obtain the WWF license, doh!). Unfortunately, I am certain that there has never been a compilation of old Technōs Japan titles on previous consoles and I am not sure how the licensing would work for one to be released today. Obviously Aksys Games have published this and I know that Technōs were in with SNK when the Neo Geo one-on-one fighter Double Dragon was released in 1995. Ballistic also did an accurate conversion of the Double Dragon arcade game for the Mega Drive, so who knows a deal may be able to be put into place to compile all these games on one disc. Aksys have also released other Technōs games on Virtual Console, including the NES titles: Double Dragon, Renegade and River City Ransom, so if anyone with decision making powers over Technōs back catalogue are reading this, then "make it so". Perhaps someone at Aksys is listening, it would be well good if Mickeymac sparked the idead for a great compilation of these rare games. ...wait, it's an Arksys game(Technos)? I thought it was made by Capcom? I guess the first paragraph confused me a little. But a collection would be pretty cool none the less. I remember Game Informer panning this game once in one of their retro reviews. Never looked very fun to me anyway. I guess I'll just go get Streets of Rage or Final Fight on a collection.